Preheat the oven to 350 degrees and line an 8 x 8 baking dish with parchment paper. In a large mixing bowl whisk together the oil, cane sugar, cacao powder, salt, vanilla and eggs. Then add in the flour and mix slowly and gently until smooth. Do not over mix, this may result in a dryer batter. The batter will be thick, spoon it into the baking dish. 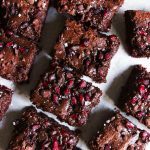 Sprinkle the top with pomegranate seeds and cacao nibs. Bake for about 40 minutes. To test for doneness, the edges should be hard and formed and a toothpick into the center should come out slightly wet. Sprinkle the brownies with flake salt and allow them to cool completely in the pan before cutting. This step is very important. I use Bob's Red Mill Gluten Free 1 to 1 Baking Flour. Gluten-free flours can be tricky, and I cannot stand by other substitutions.